Since 2003, Holtz Tax Service LLC has been providing quality, personalized financial guidance to local individuals and businesses. Our expertise ranges from basic tax preparation and accounting services to more in-depth services such as financial statements and tax planning. 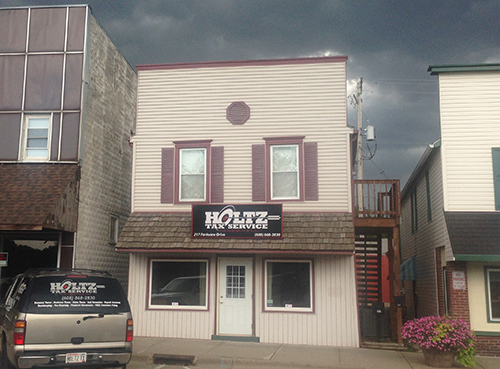 Holtz Tax Service LLC is not your typical accounting firm. By combining our expertise and experience, we assure that every client receives the close analysis and attention they deserve. Our dedication to high standards and a strong work ethic is the reason our client base returns year after year. Holtz Tax Service LLC’s goal is to be "On Target For You" and to develop a relationship that goes beyond tax return preparation. With the ability to meet with clients on a regular basis throughout the year, we can be involved in decision-making processes that are critical to success. By focusing on planning and consulting, we have come to know clients on a more personal level. We believe this type of relationship is the best way to help clients achieve their goals. Whether you are a current or prospective client, rest assured that individuals and businesses who choose Holtz Tax Service LLC receive competent and timely advice. Michael graduated from the University of Wisconsin-Whitewater with a Bachelor of Business Administration Degree in Accounting in May 2003. He resides in Milton with his wife Lindsey, and their children Carter, Gavin and Natalie. He is a member of National Association of Tax Professionals, active in the Milton Area Chamber of Commerce as well as treasurer for Milton Youth Basketball. His off-the-job interests include spending time with his family, beard growing and attending sporting events. Deana has been with Holtz Tax Service LLC since early 2015. She resides in Milton with her fiance Jayme, and their children Kelby and Mazy.